President Obama speaks with PM Netanyahu, reaffirms that the United States opposes PA bid to join the International Criminal Court. President Barack Obama spoke by phone with Prime Minister Binyamin Netanyahu on Monday, and reiterated that the United States opposes the Palestinian Authority’s (PA) bid to join the International Criminal Court (ICC). “On the Palestinian ICC bid, President Obama reiterated the United States’ position that the Palestinian Authority does not yet constitute a state and is therefore not eligible to accede to the Rome Statute,” the White House said in a statement on the phone call. “President Obama underscored that the United States does not believe Palestinian accession to the ICC is a constructive way forward. The United States continues to strongly oppose actions by both parties that undermine trust and encourages both sides to seek ways to deescalate tensions,” the statement added. 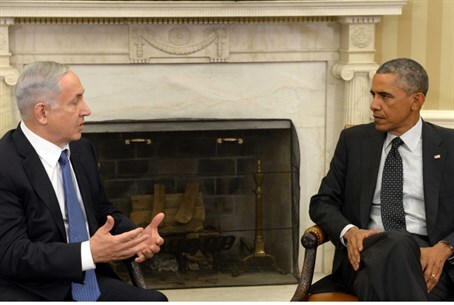 The conversation between Obama and Netanyahu comes a week after UN Secretary-General Ban Ki-moon announced that the PA will join the ICC on April 1. The announcement came several days after the PA formally presented a request to the United Nations to join the ICC. According to the White House statement, Obama and Netanyahu also spoke about recent developments in the P5+1 negotiations with Iran over its nuclear program. “The President reaffirmed to the Prime Minister that the United States is focused on reaching a comprehensive deal with Iran that prevents Iran from acquiring a nuclear weapon and verifiably assures the international community of the exclusively peaceful nature of its nuclear program,” the statement said. “The President underscored the United States’ enduring commitment to the security of Israel and the importance of continuing close cooperation with Israel on this issue,” it added.